Ken Burns has produced many historical documentaries, his Civil War and baseball miniseries among them. More recently, he tackled the Vietnam War. His partner, Geoffrey C. Ward created the book from that documentary series, The Vietnam War: An Intimate History. There are a lot of misconceptions about Vietnam, the country, the war, and the history of both. Ward traces Vietnam’s fortunes from the foundation of the nation as a separate entity from China to a French colony where it was fused with Laos and Cambodia as “Indochina” through Japanese occupation, the fall of the French regime, to the partitioning of the country that led to the US war that claimed 60,000 American lives. What often gets lost in translation is that the Vietnamese lost even more. Perhaps the biggest tragedy of the war was the mutual misunderstanding between Ho Chi Minh (the best-known and longest lasting alias of Nguyen Sinh Cung) and Harry Truman. As the Cold War dawned, European colonial empires crumbled. Some, like the British Empire, simply yielded to evolution and slowly handed off power to their colonies. The French attempted to hold on for dear life after suffering humiliation in World War II. Ho saw his cause as one of nationalism and hoped America would side with him. Truman saw a communist rebelling against a European ally and sided with France. What followed was a tragedy that spiraled out of control. 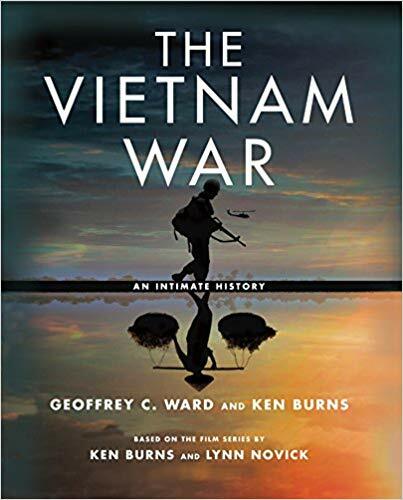 ﻿ Ward traces the war from the fall of French colonial rule at Diem Bien Phu through Johnson’s manipulating the Gulf of Tonkin incident to Nixon’s slow withdrawal and the fall of Saigon. During various phases of the war, American soldiers went from liberating the Saigon government to a mentality of “Everyone’s the enemy” to latter troops not even knowing why they were there. The book even depicts how some soldiers began to see their own command as the enemy as particularly bloodthirsty officers could find themselves the victims of “fragging,” a particularly brutal form of murder where a large grenade would be planted under the bed of a rather unpopular commander. Much of this stemmed from the local command becoming obsessed with body counts, leading to civilian deaths counted as enemy killed. Ward doesn’t shy away from American atrocities but rather interviews soldiers who, even forty-five-to-fifty years after the fact, remain puzzled as to why America would ask its personnel to do such things. He also gives voice to Vietnamese on both sides. In straight battles where North VIetnamese and Viet Cong (or the NLF as it was also known) fight US and ARVN (South VIetnamese) troops, there is respect given across the battlefield after the fact. And then there are the tales of the refugees who resettled elsewhere. Their stories prompted me to download Sypathizer, a novel by Vietnamese writer Viet Tranh Nguyen. It’s not a book for someone looking for a political axe to grind. No one gets a free pass in this. While Ward insists on letting the North’s voice be heard, he takes pains to point out that they committed just as many atrocities as the South and the US in ten years of fighting. It’s book not for the faint of heart but for those wanting to truly understand America’s biggest foreign policy mistake.